Illustrations: 48 tables, 75 figures, and 6 b/w illustrations. Over the past ten years an increasing number of field entomologists and farmers have recognized that conservation of natural enemies is important to effective biological control in many agricultural systems. 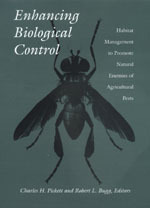 This collection addresses an important gap in the biological control literature by providing the first comprehensive summary of recent findings on habitat manipulation to control pests. Enhancing Biological Control includes contributions from experts around the world: the United States, Finland, Germany, Great Britain, People's Republic of China, and Switzerland. Chapters cover habitat modification in such areas as fields, orchards, or vineyards, and along or near the perimeters of fields, including hedges or other uncultivated areas. Generalist and specialist natural enemies are described in full, as are theoretical and practical issues. Experimental designs for studying enhancement come into play, and the editors include a modeling study that explores how the dispersal of natural enemies interacts with the positioning of refuges. This volume is an invaluable source of information to researchers, progressive farmers, and agricultural consultants. Charles H. Pickett is with the Biological Control Program, California Department of Food and Agriculture. Robert L. Bugg is with the Sustainable Agriculture and Research Program at the University of California, Davis.